For sewing cuffs, collars, and other hard to reach areas. 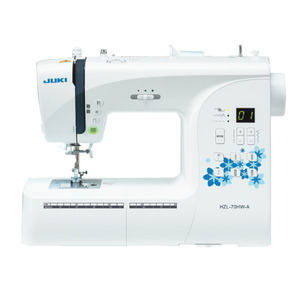 The Juki HZL-70HW is an computerized beginner's sewing machine perfect for the novice looking to explore quilting, apparel, and home decor sewing. The user-friendly interface and easy-to-follow manual makes sewing easy, even if you've never touched a sewing machine before. 80 Stitches: This machine includes all of your basic construction stitches, but also includes a variety of stretch stitches for knit and spandex-mixed fabric. You'll also get a wide range of decorative stitches to embellish and quilt beautifully. 5 Automatic 1-Step Buttonhole: This feature creates perfectly sized buttonholes with the touch of a button. Simply install the 1-Step Buttonhole Foot and press go. Sit back and relax while your machine does all the work for you. Stitch Width and Stitch Length Adjustment Buttons: With the press of a botton you can increase or decrease your stitch length and width. The settings are displayed on the LED indicator. Direct Pattern Selection: The six most commonly used stitches are easily accessible, having their own buttons on the front of the machine. Needle UP/Down Button: This feature is all about convenience. Choose whether your needle automatically stops in the up or down position. In the needle down position you can easily pivot around corners and change directions without losing your stitch position. Top-Loading Drop-in Bobbin: Drop-in bobbins are the easiest to install, reinstall, and troubleshoot. The clear cover makes it easy to check on your bobbin and monitor thread levels without having to remove the case. Start/Stop Button: Start and stop sewing at the touch of a button, no foot control needed. Simply unplug the foot control and press the start button. Drop Feed Dogs: With the flip of a switch, easily disengage the feed dogs. This allows you to do free-motion sewing, like quilt stipple and darning. Free Arm with Built-in Storage: The detachable sewing bed is quickly removed to allow for circular sewing, like hemming pants and shirt cuffs. Conveniently store your accessories in the detachable sewing bed. Sewing Speed - Max. 800 s.p.m. Dimensions: 15.7" X 11.4" X 7.4"